If you’re buying a used car in Hawaii, research the vehicle. It is important to get all information. Make sure to get a vehicle history report. It can reveal whether the car has been salvaged, rebuilt, flooded or reported stolen. Hawaii has no statewide database for vehicle titles and registration. Each county has their own regulations. Requirements may slightly vary per county. The Application for Registration, Form DF-L(MVR) 1. A Bill of Lading or Out-of-State vehicle permit with the date of entry to the port clearly indicated. Vehicle weight certificate. This may require visiting a Certified Scale. How to Register a Vehicle in Hawaii? Requirements for vehicle registration depend on which county you are residing. Select your county below for specific procedures. 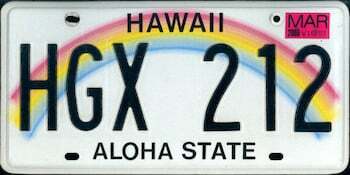 The Hawaii standard license plate features a rainbow with a white background and black lettering. Special license plates are also available. Check with your local Hawaii motor vehicle licensing office for details. Honolulu Division of Motor Vehicles and Licensing (CSD): (808) 768-4325. Hawaii Motor Vehicle Registration : (808) 961-8351. Maui Motor Vehicle and Licensing Division : (808) 270-7363. Kaua’i Department of Motor Vehicles: (808) 241-4256. You move to another state. Get a new type of license plate (e.g., specialty or personalized). Buying a used car in Hawaii? Don’t make a costly mistake. Run a Free License Plate Lookup for your vehicle! Uncover the full-story of your Hawaii-registered vehicle in seconds! Run a Free Hawaii License Plate Lookup now!